Nintendo will reshape the home entertainment and video game landscape with the launch of its heralded Wii™ home video game console. The Americas will lead the worldwide launch on Nov. 19. 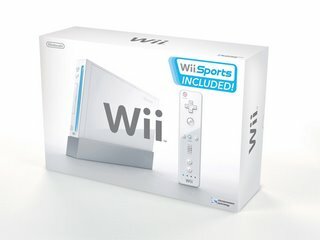 Wii will be sold as an affordable, mass-consumer product at an MSRP of just $249.99. The price includes one wireless Wii Remote controller, one Nunchuk™ controller and the groundbreaking collection of five different Wii Sports games on one disc, which anyone can play using simple movements, experienced or not. Every Wii console includes another distinctive feature: a series of on-screen “channels” that make up the Wii Channel Menu, which makes the console approachable and customizable for everyone, from the most avid gamer to people who have never played before. The Wii Channel Menu is the starting point for all of the console’s functions. The “channels” offer a gateway to a rich variety of entertainment options. When connected to a TV, the Wii Channel Menu offers a simple interface, letting users pick games to play, get news or weather, view and send photos or even create playable caricatures of themselves to use in actual games. Additional functions allow users to redeem Wii Points and download classic games to Wii’s Virtual Console™. The variety of options available through the Wii Channel Menu motivates both gamers and non-gamers to turn on Wii’s power every day. Wii is creating worldwide excitement with its unique control system, an inventive, first-of-its-kind controller whose position can be detected in a 3-D space. The new controller allows users to pinpoint targets in games or move through the Wii Channel Menu with precision and ease. This intuitive control system will be understood immediately by everyone, regardless of their previous experience with video games. With this one small controller, Wii makes games both easier and more intense than anything previously experienced. For example, in the Wii Sports tennis game, players swing the Wii Remote like a racket to hit the ball, as in real life. They can add topspin or slice the ball just by angling their hands and wrist like they would in a real match. Fils-Aime made his remarks in New York, shortly after Nintendo executives in Japan announced Wii will launch there on Dec. 2. Between launch day and Dec. 31, Wii owners will enjoy a robust lineup of 30 software titles, with selections for everyone from video game veterans to newcomers. Some top Nintendo launch titles include Wii Sports, a compilation of tennis, baseball, golf, bowling and boxing; The Legend of Zelda®: Twilight Princess; and EXCITE TRUCK™. While publishers are free to set their own prices for games, first-party Nintendo titles will have an MSRP of $49.99. Wii’s self-loading media bay also can play the entire library of more than 530 Nintendo GameCube™ titles from day one. Third-party developers around the world have lined up to provide unprecedented support for Wii.